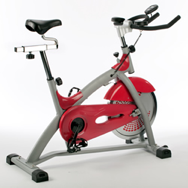 The V-Fit Motive Fitness Aerobic Trainer Exercise Bike is a Single Action Cycle with Forward and Reverse Motion. High Torque Chain Drive System with Fixed Wheel Drive. 13kg Balanced Cast Iron Flywheel Resistance System with Chrome Rim. Mechanical Calliper Friction Pads with Felt Backing. Twist Adjust Micro Tension Controller Resistance Adjustment. Contoured Formed Welded Tube Handlebars with High Density Foam Padded Hand Grips and Forearm Pads. Twist / Pull Threaded Knob with 3-Position Height Adjustment. Racing Style Saddle with Angle Adjustable Fitting. Twist / Pull Threaded Knobs with 12-Position Height Adjustment (Vertical) and 4-Position Reach Adjustment (Horizontal). Racing Style Pedals with Adjustable Toe Straps. Monitor Features: Single Screen 5-Function with Calorie (Theoretical Calorie Burn), Distance (Miles), Scan, Speed (mph), and Time (Minutes / Seconds) Modes. Dimensions (in use): L121 x W50 x H115cm. Weight: 38kg.